Doom Patrol: NEW DOOM PATROL!!!!!!!!!!!!!!!!!!!!!!! 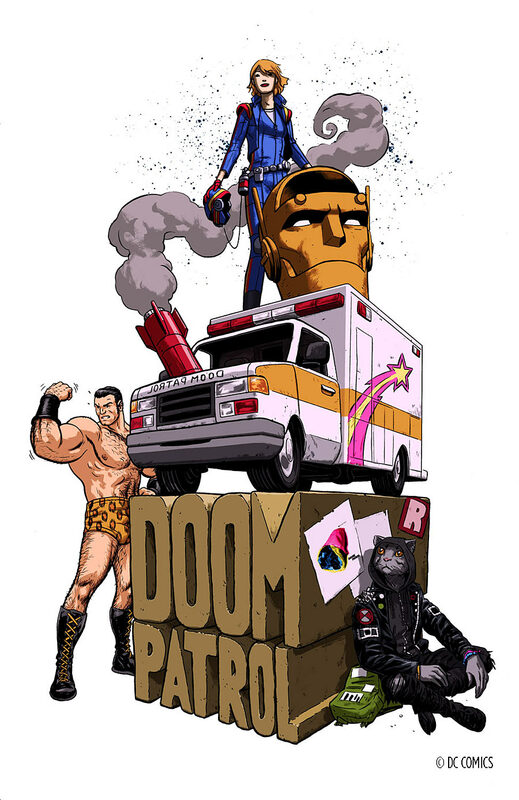 Announced at ECCC while I was at work, the DOOM PATROL IS RETURNING TO COMICS!!! Looks like Gerard Way is getting his way and bringing the DP back! Previously reported as a collaboration with Becky Cloonan, the project was presumed dead, but DC has deemed us all worthy! This September, in the spirit of Grant Morrison's legendary run on the series, along with other classic incarnations of the characters, writer Gerard Way and artist Nick Derington will put their unique stamp on the world's strangest heroes taking on the universe's strangest villains. Yes! Yes! YESSS...! Whu-- who's that Oedi-looking cat guy? Pretty blooming good news. I do hope we get Hot Hands in there. I'm sure Hot Hands is in the back of the ambulance. Finally since everyone else it appeared was getting a new start. I will be reading some Doom Patrol comics to get ready. Cat-Guy - I like that name. Bout time DC had a Marvel Knights-ish/Verigo superheroes again. What would really make my day is if Dial H For Hero was a member. So the patrol can randomly pick joe blogs on location of their adventures give them the dial and get some random hero for the day.